This post is part 6 of a 6 part series featuring Experience Columbus Days , which takes place Oct. 8-11. During that time, Columbus attractions offer 50% off (or in some cases, BOGO or free admission). Plus, the restaurants of Dine Originals Columbus offer 25% off your food bill for two people. In this post, Tony features great spots for history buffs to enjoy during Experience Columbus Days. 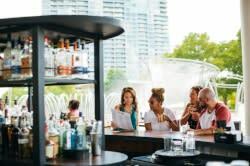 You can also check out previous posts that feature delicious dining options , plus outings that are great for groups , great for dates , perfect for art fans and fun for the whole family . Have a great weekend experiencing Columbus. The discounts start tomorrow! Did you know that downtown Columbus was once a strand of forest called Wolf’s Ridge? Or that Columbus was once known as the “Arch City,” because dozens of wooden arches spanned the streets at the turn of the twentieth century? If you can appreciate history and you&apos;d like to take advantage of Experience Columbus Days discounts, this is the post for you. This weekend you can save some sawbucks at these historical hotspots. Ohio Historical Center The name may suggest history, but the experience screams it. Ohio has been, is, and will continue to be a leader in sciences and humanities. The exhibits in this unique building serve to reinforce that statement. They guide you through the history of the powerful personalities, significant events, and technological developments of a state and its people; without which the nation and the world would be dramatically different. With the discount flyer, save 50% on admission. Kelton House Museum & Garden This beautifully restored Greek Revival home-turned-museum showcases two distinct experiences. If you’re interested in the polite society then the architecture, social items, and interior décor will open your mind to feel a well-to-do merchant’s dwelling circa 1860.This museum also immerses you in the history of the Keltons, a progressive family who fervently supported civil liberties. In honor of his abolition work, Fernando Kelton was a pallbearer for Abraham Lincoln in his funeral procession through Columbus, and Fernando’s daughter-in-law Isabella was one of the first four women to attend the Ohio State University. The tour of the home with the period-specific characters is a wonderful opportunity to experience local history. With the discount flyer, save 50% on admission. Historic Roscoe Village This tiny town showcases a time of prosperity for Eastern Ohio. Long before the Interstate, and outmoded by the boxcar, Roscoe was a booming hub of commerce. Canal boats, pulled by donkeys, were the primary means of moving consumer goods into Central and Southern Ohio, and moving furs and agricultural goods back to the Northern ports. This village places you in a lifestyle long gone; the weavers, craftspeople, blacksmiths, and other trades people are dressed in period clothing and demonstrate their way of life. With the discount flyer, save 50% on an adult Canal Town Journey Tour ticket. Santa Maria I bet you know this: Columbus sailed the ocean blue in 1492. I’m even going to assume you know the Santa Maria was the flag of his three vessels. What you might not know is that the ship was only seventy feet long (6 cars parked bumper-to-bumper) and carried forty men for three months. And this was before deodorant and DVR were invented too. Yeah. The replica provides you with some really cool perspectives on what our ancestors went through to colonize America. Learn about the voyage and the history of Christopher Columbus; take photos of you behind the wheel, raising the mizzenmast, or swabbing the poop deck. With the discount flyer, save %50 on admission. Motorcycle Hall of Fame Museum The interesting parts of history are the stories that remind you that bigger-than life personalities are often average folks like you and me. While the Motorcycle Hall of Fame Museum is true to its name in that has some of the most impressive motorcycles ever raced or made, I think the highlights of this museum are the stories of famous racers, owners, and builders. Oh, and there’s a twenty-three foot long motorcycle here. With the discount flyer, save 50% on adult admission. We&apos;ve said it before and we&apos;ll say it again: the all-important discount flyer can be found here . You&apos;ll need it to take advantage of these and all the other savings throughout the upcoming weekend.